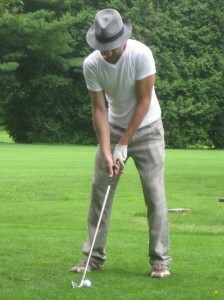 I play a game of golf once a year. I’m not bad for only playing once a year, but let’s be honest I’m not great either. 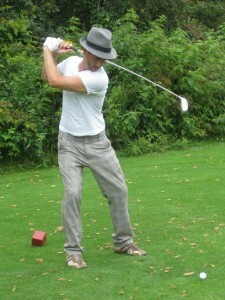 I once took a golfing lesson from an Australian golf-pro in Vietnam so I know the basics of how to stand, swing, and stay focussed on the ball despite the distraction of the swing and the overriding desire to see where the ball went. Sounds easy right, but it’s actually a lot to remember, not to mention the addition of whatever other pointers your fellow players offer up to further clutter your brain– and trust me they always have advice! Golf requires an awkward stance or at least one that does not come naturally: Feet so far apart, weight forward, knees slightly bent, shoulders relaxed, grip firm, little fingers interlocking (or not). It gets far too complicated to get it right – all at once anyway. And yet the times I relaxed into my swing and didn’t try to get everything perfect, to micro-manage by over-thinking … well, somehow that was the swing that connected with the ball and sent it flying down the fairway. It’s easy to get frustrated when things don’t go right. And yet the times I forgave myself, not taking my grudges into the next stroke, I had a far better outcome then when I tried to make up for the last bad swing. Don’t Try to Hard. Don’t Try to Impress. I was playing with my step-father and his chums, all of whom are much better and far more practiced than I. The times I tried to keep up with them were the times I fell short because my focus was on their achievements and not my own. Don’t Try and Kill the Ball. 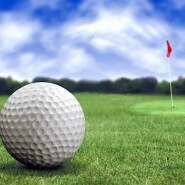 Golf is not a game of brute force and I’m guessing life isn’t either. I’m a strong guy, something I thought would be my advantage against my competitors (see lesson above). Yet the times I tried to kill the ball usually led to missed swings that actually hurt my back and injured my pride. Golf is a game of finesse. Swinging from a place of quiet confidence and inner belief achieved far better results than attacking the situation with aggression. As embarrassing as it is to seeing huge pieces of turf flying when it was supposed to be your golf ball soaring through the air, acknowledging those mistakes by righting wrongs and putting your divots back is part of making amends and moving on. Sometimes in my enthusiasm to see how successful I’d been I’d take my eye of the ball and look to the future, forgetting to concentrate on the present. When I stayed focussed on the completion of the task at hand, letting my friends see where the ball went, that’s when I achieved stronger results. Enjoy the Camaraderie of your Fellow Players. Golf, like life, is a game best shared. While the challenge of the game might have brought you together it is the camaraderie of your fellow players that enhances the experience: a bad stroke becomes funny; a difficult shot is given additional support; while a great putt is doubly-celebrated. Every Hole is a Fresh Opportunity. Every hole offers the opportunity to apply the lessons learned and skills acquired from previous greens. Is this any different than having a bad morning but being determined to turn your day around in the afternoon? At the very least each new hole offers a fresh slate and new challenges to embrace and conquer. Celebrate your Skills, Whatever They Are. I discovered I have a keen eye and a straight stroke. Twice I managed, from an impressive distance, to actually hit the flag pole. The stubborn ball bounced off the pole and back onto the putting green instead of into the hole but I didn’t care, I was too excited by a new found skill and ability that I actually didn’t care about the outcome. Forget About Measuring up to the ‘Pars’ For Each Hole (unless you’re that good!). Concentrate Instead on Just Having Fun. Nice post written here. Teaching some good points here. i enjoyed reading this, thanks for sharing with us.